There is an urgent need to find out how to make fire grates from clay in places like Ethiopia, Malawi and Rwanda where absolute cost is an issue. The easiest way to improve air quality and complete combustion is to provide preheated primary or secondary air the to the fire. Using clay/porcelain/ceramic materials would be best. There are some interesting things going on in ceramics. My son's ceramics instructor at Queen's U (Kingston Ont) had managed to make a ceramic material that was flexible like rubber. We want cheap, strong and thin and 'local' where possible. I would love to have a ceramic fire grate that would go into our all metal cooking stoves. 1. I talked with Damon Ogle at the Seattle meeting (Jan 2003) about a materials problem that I would love to see several people work on beside myself (I'm in because my wife is a potter). That is adding a "best" glaze to the light weight ceramic blocks that Damon and others have been preparing.. We discussed one that would be reflective - but it should also have the right strength and shrinkage properties so as to add to the overall strength of the brick. (And fuse at the right temperature.) There are certain coating materials in the solar collector business that are typically high absorptance and low emittance - we want just the opposite. 2. One can buy (at a pretty high price) refractory cements - that look like they might be manufacturable in developing countries - and offer nice patching and construction alternatives. 3. We have had differences of opinion on using hoods vs. chimneys. The former would only have to satisfy quite minimal temperatures - but need to be appreciably larger than chimneys. Perhaps there are some foil products that your class/student(s) could work on - with light frames. 4. On the other side is the chimney material problem. Maybe cast concrete? (over a wire mesh?) certain steels? ceramics? The key problem is cost (but lifetime has to be good as well). Can we do this out of used coca cola cans? The most important thing that we now need to do is to determine how to make best bricks (insulative, refractory, durable) from pumice and 15% clay. 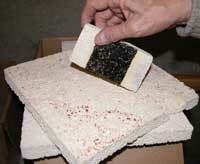 Can we make pumice bricks that are as good as the perlite bricks? Pumice changes color( to red)and shrinks around 900 to 950C or so. 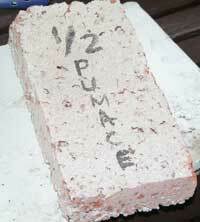 The bricks need to be fired lower than this so that the pumice remains full of air. If you can find light weight pumice this would be valuable work with immediate applications in Central America. 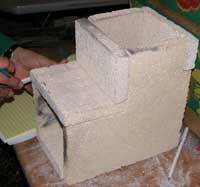 I hope that your students can make pumice bricks and compare them to perlite and sawdust bricks. for the prototypes he was demonstrating. I don't remember the thickness. How does that compare with the 50% pumice, 50% clay-organic or other materials? 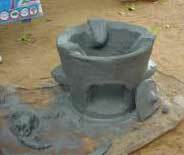 Can Rogerio, GTZ or others supply samples of materials they have fired for their stoves in mass production? A question for the group: what about thermal cycling - would a test of accelerated aging of the ceramic or insulating materials be useful?